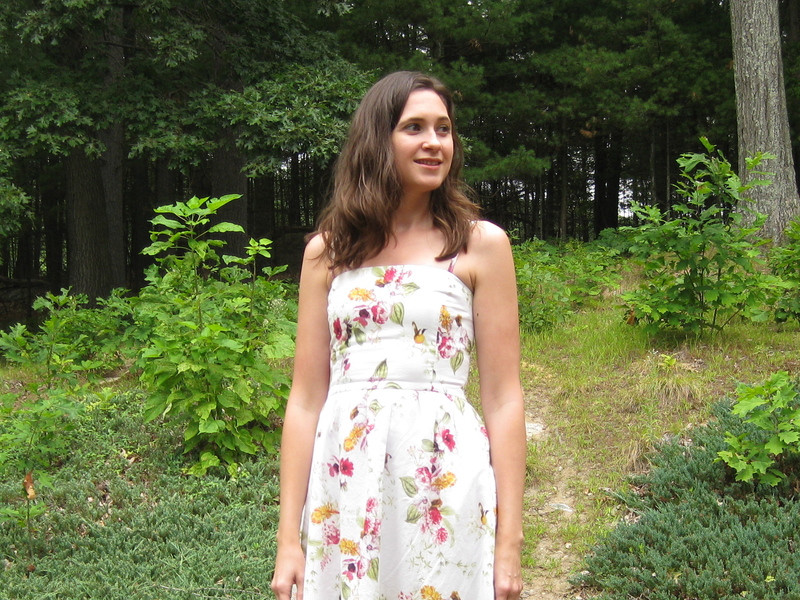 i made this dress mid-summer and it feels kinda mean and cruel posting such a summery dress just as we’re moving into cooler weather… but hey, i’m right on time for southern hemisphere folks, yeah? i wanted this dress to be light, casual, and free of fussy details. i decided on a princess seamed bodice, thin adjustable straps, shirred back, and a lightly gathered skirt. i fell in love with this fabric at my local fabric store, initially to make a dramatic maxi dress. i thought it would be perfect to swoosh around in on our summer Texas vacay, but i’m glad i ran out of time for that. it would have been fabulous, but highly impractical for much of anything else. for my dress, i went back to an old pattern that features the princess seamed bodice i wanted (i’d go track down the pattern number, but it’s nothing special and i wouldn’t really recommend that specific pattern). i had already fit this pattern before (i’m so not linking to that old post, however i wore it during MMM), but i really didn’t trust past me’s fitting techniques so i started from scratch. one muslin was enough (yay!) so i threw out my old tracings and replaced them with my fresh fitting. so happy that past me traced to begin with! this pattern includs crazy amounts of ease, so this time i knew enough to pick a size based on the finished measurements instead of the size chart. once i fit the bodice, i took the back panel and added a few inches since i would be shirring it. i also moved the zip to the side because i don’t like zips to run through the middle of shirring. to keep the upper edge of the bodice and the waist seam of the shirred panel stable, i use 1/4″ elastic to give me a nice clean edge. so, the first row of stitching from the top of the panel is done in regular thread, but allowing enough width to insert elastic between the shell and lining. from that row on, i shirr each row using elastic thread. then i leave enough space at the bottom of the panel so that once i attach the skirt, i can top stitch the waist SA towards the bodice, (creating a channel) and insert elastic later. i secure the elastic by stitching in the ditch between the back bodice pieces. i waffled a bit about how to go about lining and/or underlining the rest of the bodice. in the end, i decided to underline the rest of the bodice pieces, and draft a facing to finish the upper edge. this worked out well and kept the bodice nice and lightweight. as i mentioned before, the skirt is only lightly gathered. i had plenty of fabric to work with, but i had to resist the urge to make a super full skirt. i tend to wear dresses with simpler skirts more often, plus it reduces the amount of bulk at the waist. i decided to make adjustable straps since i always have a hard time deciding exactly how long to make them. i tend to fiddle with them forever and well—that’s annoying! this is also perfect if you have one shoulder higher than the other. much as i’d like to think i’m symmetrical, i’m sure i’m not! thin straps are far more likely to want to slip off the shoulders, so this is a great way of dealing with that. 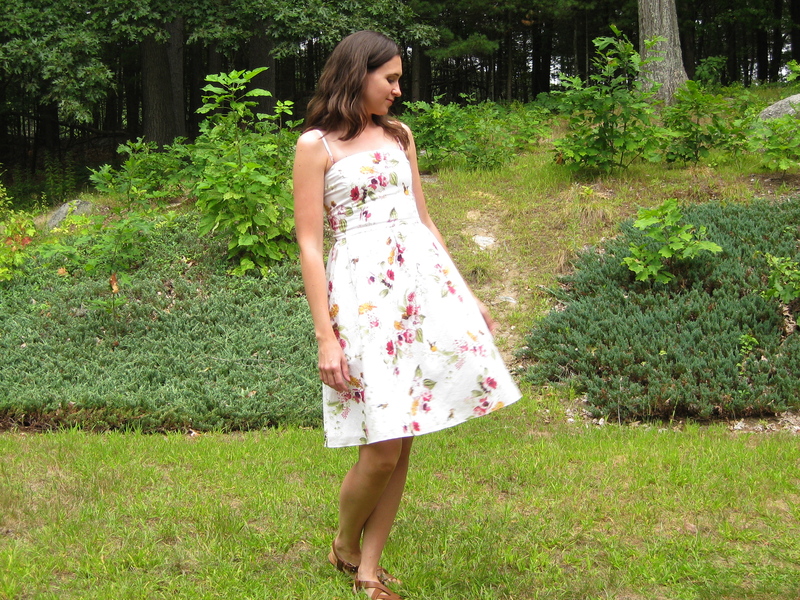 long story short… i love how this dress came out and i managed to wear it several times this summer. actually i’m hoping to sneak in a few more wears since it looks really great with a jean jacket. word has it we may hit the low 80’s F over the weekend… fingers crossed!